9 Compelling Reasons to Hire an AngularJS Development Company Now! “Keen on Developing an Application?” → Why don’t you consult with a Software Development Company providing AngularJS Development Services?—You should Hire AngularJS Developer–It will be best for you to Shake hands with an AngularJS Development Company. Well, If you have ever seriously given a thought about Developing a Web Application, then surely you must have bumped into such propositions at some point or the other. But are you perplexed as to WHY such Emphasis is being given over AngularJS? So Stay Tuned to this Blog to know the reasons for Why every other Techie that you consult with will push you to find AngularJS Developer for your Web Application Development Project. We at ChromeInfotech- An AngularJS App Development Services Providing Company, Put Our Trust into AngularJS to Boost up and Manifold your Business Venture through a Dynamic Web Application. Are you stuck in the never-ending loop of Deciding upon a Development Framework for your Web Application? Well, your confusion is Justified! Your Business Venture is like your child that you need to nurture and take care of since its emergence. And definitely, you will want the best for it! If you want to expand your Business through a Successful Web Application, then using AngularJS as a Front-End Development platform is the right choice for you. It is not just a random statement just for the sake of saying. I am talking from our own experiences that we have come across as an AngularJS Development Services Providing Company. Let us have a look at 2 such successful ChromeInfotech Projects where AngularJS played an essential role in their Success. 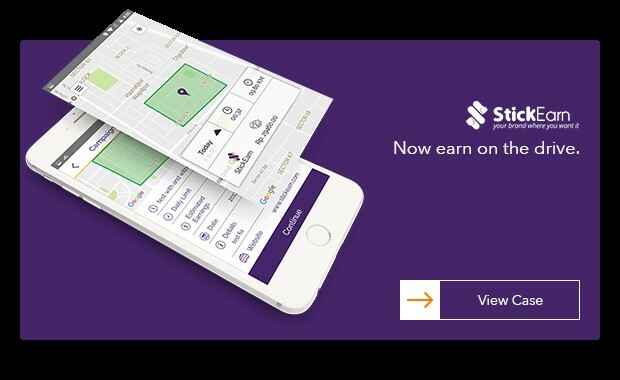 We were fortunate enough to Work on this excellent project of Developing An Application for an Outdoor Advertising Platform. Our Client wanted An Application that would facilitate Advertisements on the road by collaborating with Car owners. Following our Client’s requirement, We used AngularJS as one of the Technologies for developing this Application. We delivered the Application to our Client well before the Deadlines. He was also utterly satisfied with the final product as we met all his expectations and it turned out to be an excellent Application. The Cherry on the Cake was the “2 Million Dollar Funding” offered to the Project. You can get more information about this project from our Website. It is another of the many projects that we are proud to have been a part. Our Client wanted to build an Application to would facilitate 24/7 Medical Helpline and Private Medical Transport services to the users. Along with other techniques, we also used AngularJS for its Front-End Development. By using AngularJS, we were able to provide a seamless User Experience which played a huge factor in the success of this App. This project as the above one was also able to bag a million Dollar Investment. You can visit our Website to learn more about this project. Similar to yourself, the Client’s of these two Projects were also initially confused regarding What development Platform(s) they should choose. And Keeping our Client’s best interest in mind as always, we suggested them to use AngularJS as one of the Platforms. Thus attaining an Application with seamless and amazing User Experience that greatly helped to boost up and expand their Business. The Reasons- Why We Suggested AngularJS to our Clients, And Will continue to do so. In recent years, AngularJS has gained such popularity among AngularJS Application Development Companies that it has now become the mainstream Framework for Front-end Development of Applications. Although AngularJS acts as only one piece of the Puzzle. Any Angular Development Company that you hire will require other technologies along with AngularJS to complete the whole development process. Using AngularJS as one of the Front-end Development Frameworks will increase the efficiency of the Application Development Process. As a result of which We will be able to deliver you an excellent state of the art Application. With new and better technologies being continuously developed and religiously, it has become hard for the already present ones to hold their stand in the Market. But that’s not the case with AngularJS. AngularJS has been able to hold its place as the most popular and consistently used Front-end Development Platform. It is evident from the below Google Trend Result which shows a graph depicting the popularity of different Front end Developing Platforms(2017-2018). 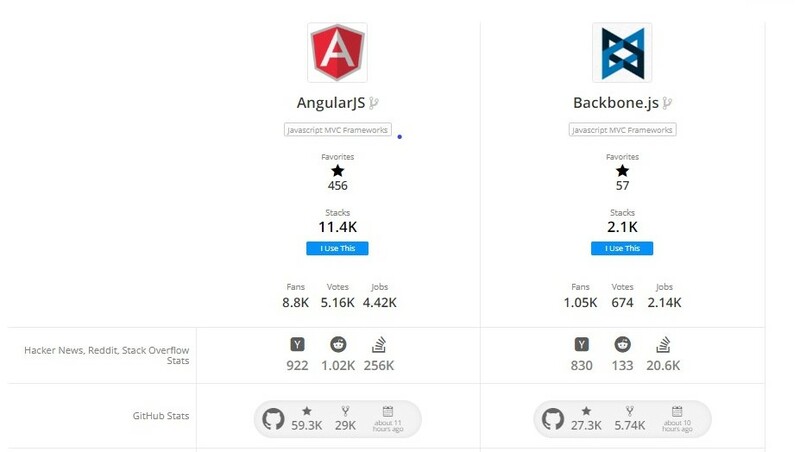 But no has been able to reach the level of popularity and demand of AngularJS. 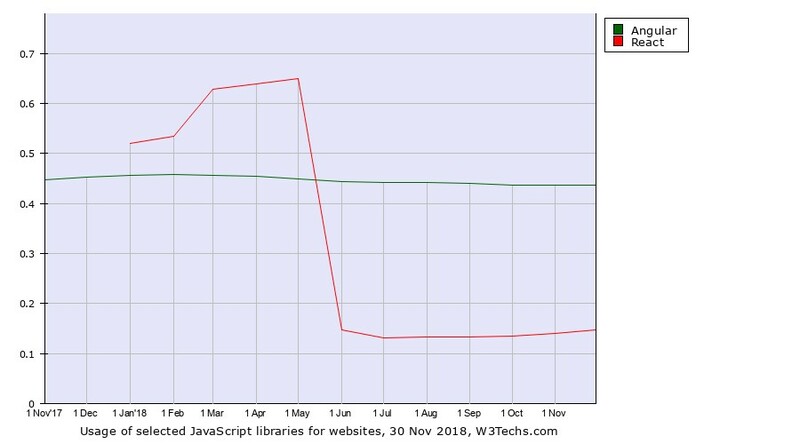 Through 2017-2018, the % of Web Applications using AngularJS has been almost constant. 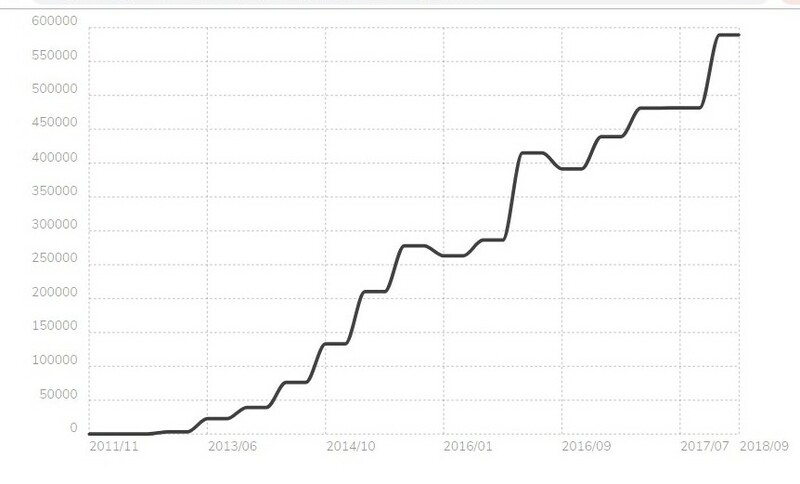 While a steep decline can be seen in the usage of ReactJS for Web Apps. Also since it’s an official release in 2010 under the MIT License(More on this later.So stay Put! 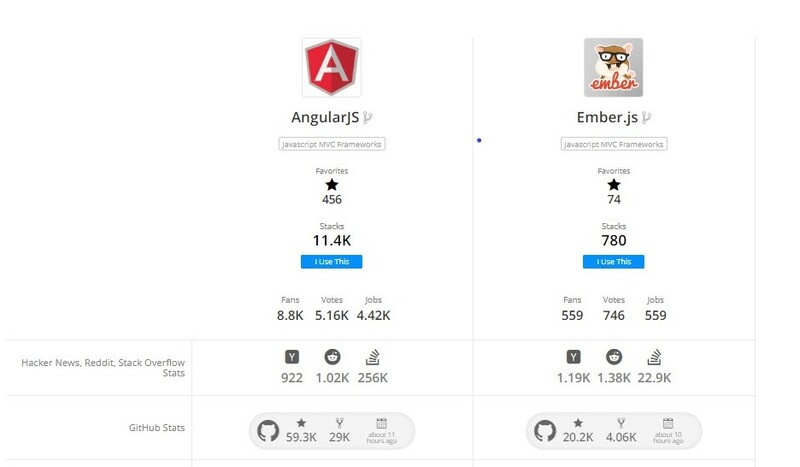 ), the number of Web Applications making use of AngularJS has increased exponentially. Have made use of AngularJS as their Front-End Development Platform. Hence Another reason for Us and also for You to love AngularJS. Such Big Companies won’t associate with any Technology until and unless they are being benefited from it. And Being used by some of the leading Platforms and Businesses automatically increases the value and authenticity of AngularJS. So We are pretty sure that you can Trust AngularJS with your Business Venture. And find AngularJS Developer to deliver you the perfect Web-based Solution. 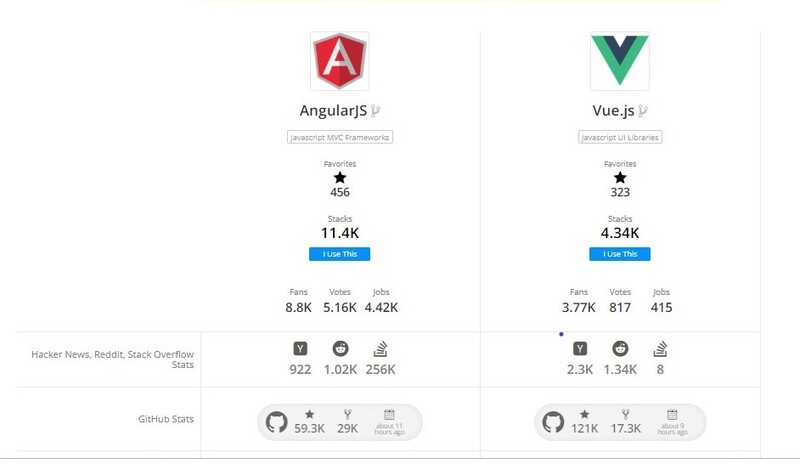 You can look at the below images to get an idea regarding How popular and loved AngularJS is in comparison to the other Platforms. The courtesy for the comparisons goes to Stackshare- A Platform that aims to help App creators, developers, and emerging Entrepreneurs to compare and find the best technology for their project. Stack Overflow-One of the largest platforms for Developers and by Developers to learn, grow and engage with different tools. GitHub– A web-based hosting service for code version control using a concept called Git.g service for version control using Git. Mostly used for computer code, It helps software developers and any other person associated with coding to successfully manage their source code in one single place. Reddit-A Discussion and Rating oriented Web Platform. If you carefully observe the images, you will come to know that AngularJS is indeed the most used and a favorite among AngularJS Development Company as well as various Entrepreneurs. I don’t mean to put down the other Platforms- They may have their unique advantages and disadvantages too. But AngularJS must possess some remarkable Technical features which have made it a Hit among all Business Entrepreneurs as well as AngularJS development companies. The M stands for Model, V for View and C for Controller. MVC Architecture of AngularJS facilitates an easy and efficient combination of all three levels. It is a unique feature of AngularJS that will build you a better User Experience. Click Here to get a demo of how 2-way Binding can improve your Applications’ UX. To not confuse you with its technical definition, Here’s how Dependency Injection will benefit any Angular Web Development Company and hence your Application- By increasing the speed and efficiency of Testing your Web Application. AngularJS Enables deep linking by default. Deep linking will help your Web Application to get indexed so that it can be easily searched by search engines such as Google, Yahoo and so on. These core parameters of AngularJS makes it a win-win situation for both Businesses and AngularJS Web development Company. AngularJS makes the development process somewhat less stressful and more comfortable. 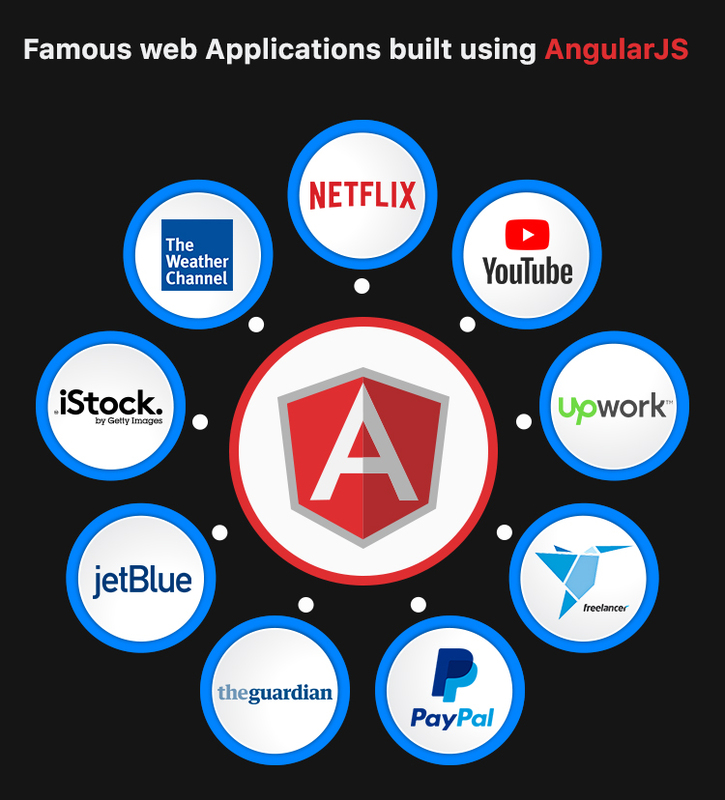 Thus, providing the Angular App Development Company an opportunity to give their attention into other much more important details of the Application. Satisfactory output in a definite Period! Well, If you decide to you hire an AngularJS development company like Us, You can be rest assured that you will get an App that is spectacular in all its essence without compromising with your Deadlines. AngularJS holds all the tools and pieces required for the overall Client-side Development Process. With AngularJS application development, we don’t have to depend on or integrate any Third party functionalities. Thus, saving up a ton of time. Also because of the simplicity of the codes, The AngularJS developers don’t usually get stuck with resolving errors. Thus, allowing the members of AngularJS development Company to focus on other important aspects of your App. “What if my desired Application is quite complex and sophisticated”? It may. But not with AngularJS. By using AngularJS, even Larger Projects that require the integration of multiple functionalities can be finished off within an average period. With AngularJS, our developers will be able to write codes for different functionalities parallelly. And with the added advantage of code re-usability by developers, your Application will be up and ready in no time. AngularJS makes Testing A piece of cake! Our job does not get over until and unless We have Tested your Application. We test your App for the presence of Bugs, loopholes, errors, improvements and so on. It is done to make sure that we do not leave behind any errors in your final Application before it is all set to be Launched. Now usually Testing takes up a significant amount of our time. But AngularJS is a miraculous Platform that makes it an easy and a quick job for Us or any other Companies working on AngularJS Development. So with Reduced Testing Time, your Application will be ready for launch in no time. Case 1-After using application with a multitude of useful features and functionalities. My Review on the Application-It is good and useful. I give it 4 stars. Case 2-After using an Application with a multitude of useful features and functionalities. An impressive, aesthetically appealing and engaging User Experience. My Review on the Application- It’s an excellent App. I rate it 5 stars and would recommend it to everyone. See the impact that User Experience can have on users? With tons of Web Applications in the Market, everyone is competing to draw in customers. And the best way to attract and engage Users is through an excellent User Experience. At ChromeInfotech, We can help you to achieve that by using AngularJS to make a Single Page Application(SPA) for you. Single Page Applications are Web Applications that facilitates real-time and dynamic interaction with the users. What happens when you click on an image or a feature? A new page starts loading in your screen. Any navigational action by the user will not take you to another page but rather dynamically re-render the content of the present page. Thus, SPA helps to provide a speedy, smooth and fluid like User Experience. However, building SPAs can be quite a complex and time-consuming task. But not with an AngularJS web development Company as your service provider. Choose to Hire AngularJS Developer and watch your Application being developed into a SPA without much hustle and bustle. All thanks to AngularJS’ in house Libraries, tools, and components. If you want your App to embrace a fantastic User Experience, then AngularJS is the answer to that. Deciding to build an Application is quite stressful in itself. Imagine yourself being jumbled up in some Legal issue. Such a mess that would create! The Legal “Affair” that I am quoting here is regarding the Licensing Issues of any Open Source Development Project. AngularJS uses the MIT License– The most fluid and permissive Licence. It is also one of the most popularly used software licenses. Such a license won’t put you under the radar of Legal obligations. It is another reason why at ChromeInfotech, we prefer AngularJS for your Business Ventures. Don’t think your Application is going to work out as expected? We can renovate your Application without much commotion and in less time. I assume that you must know the importance of MVP in the Application Development Process. What is an MVP and why is it essential for your Application Development Process. MVP stands for Minimum Viable Product. You can think of it as the most Basic or a mini version of your Application. While making an MVP for our Clients, we go through a thorough Market Research phase followed by integrating the basic features and functionalities to form the smallest possible solution. And then use it to determine If your future Application will be a Success in the Market. Let’s suppose that your MVP passed the test- Then it’s well and Good. In such a situation, all the codes need to be rewritten and revised. Such a waste of time Huh? You will be intrigued to know that this process of rewriting can be accelerated by Choosing to Hire A company that provides AngularJS web development Services. AngularJS is very easy to implement as compared to the other frameworks. So even if the codes of your Application needs to be revised at any point, We can easily do the required changes in very less time. And quicker the task, better it is for your Business. Isn’t it? AngularJS is Powered by Google- The Tech Giant. The AngularJS that we know today was first created by Misko Hevery and Adam Aborns(Developers at Google) in the year 2009. And it is now being maintained by Google. Who wouldn’t love to be working with a Technology that is supported by one of the Leading Tech Player such as Google? We, at ChromeInfotech, love it and so will you! Any Company providing AngularJS App Development Services including yourself can be rest assured that Google will always try out new ways to improvise AngularJS and come up with updated versions. Also, Developers can work with a stable and prominent Codebase. By using AngularJS, We can refine your Application’s safety and security. 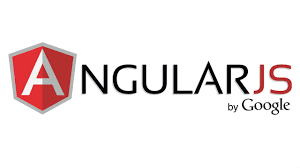 We understand that the security of your Application and its Data is one of your main concerns when you approach Us or any AngularJS Development Company. Cyber attacks have become quite a common sight nowadays. And this is another reason why we suggest AngularJS to our Clients. But AngularJS contains inbuilt protective measures against attacks such as HTML injection attacks and Cross-site scripting. So go out and Hire AngularJS Developer if your Application’s security is a big deal for you. Now, Although all of the above benefits of AngularJS are important at their place. We being a specialist AngularJS development Company can make use of AngularJS to deliver you a Dynamic, Responsive, Interactive, Flexible and High-Performance Web Application within a restricted time frame. Such efficiencies in your Application will ultimately benefit your Business venture by Bringing In Revenues, Improving ROI(Return On Investment) and Increasing Turnover. If you also have similar questions on your mind, then Scroll down to know the answer! What kind of Applications Can We Develop at ChromeInfotech using AngularJS? With an Angular Web Development Services providing Company like Us, any category of Applications can be built using AngularJS. But if you are specifically aiming for a dynamic and more interactive Web Application- Then AngularJS could do wonders. You will be pleased to know that some of the most popular and Globally used Applications are built using AngularJS. Some of the most universally used Applications belong to the class of Video streaming Apps. These kinds of Apps usually require a responsive and interactive User Interface. And That is why some globally recognized video streaming platforms have adopted to use AngularJS in their Applications’ Development. I am sure you must have made use of any Travel App at some point or the other. If you look at any Travel Application, you can find them to be very dynamic. It is one of the principal requirement of a Travel App. And is the core reason why We suggest AngularJS to Our Client’s who approach us with a vision of Developing a Travel related Application. To give you an example-The Web Application of JetBlue involves AngularJS too. Mobile Commerce(M-Commerce) refers to the process of carrying out online transactions through devices such as Mobile phones and Laptop. PayPal– One of the Giants in this sector has also made use of AngularJS in their Application. Weather.com– One of the world renowned weather Application has been developed using AngularJS. These are Applications that let Business owners and employers hire Freelancers for their project. If you already haven’t heard of, Upwork and Freelancer are two such popular Applications. TheGaurdian- It is one of the Leading applications used for uploading and publishing blogs, contents, articles. This Web Application showcases a fantastic UI-Thanks to AngularJS of course. The categories mentioned above are just a fraction of the different type of Web Applications that can be built using AngularJS. Below is a distribution of the different genres of live Web Applications present on the Internet that makes use of AngularJS. Then Always Feel free to get in touch with us. We will be more than happy to fix up a session and discuss your Idea, vision, needs, and requirements for your upcoming Web Application. We can also provide you with a dedicated team of AngularJS programmers and developers for hire related purpose. Now If you think that I am going to end the blog here, then you are mistaken. So what exactly do I mean by AngularJS Frameworks? Developing an App is not an easy job. Even if you Hire expert AngularJS Developer, he still would have to go through a tremendous amount of labor and mental pressure to get you a Perfect App. So, various Front-End Frameworks supporting AngularJS were built up to relieve Developers from stress and ease up the development process. And Less strain means more efficiency. Which will ultimately affect the quality and performance of your Web Application? It is a perfect arrangement that is beneficial for both You and the Angular Development Agency! These frameworks have various inbuilt Web Components and features. So, any Company providing AngularJS Web Development Services can make use of these to power up and built top-notch Web App solutions. 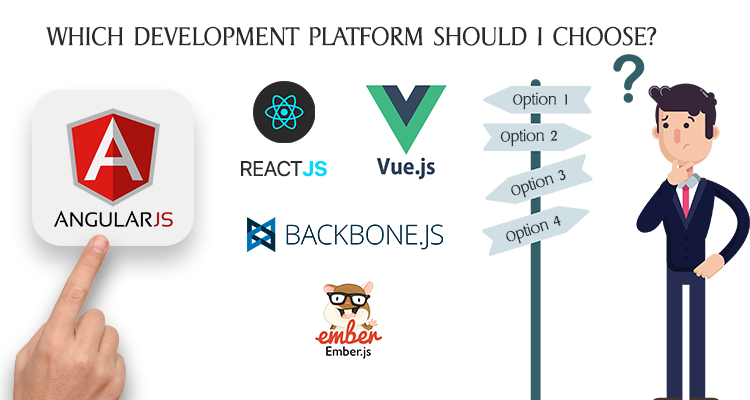 Now since there is such a wide range of Frameworks available in the Market, it can be quite a task to decide on a single one. If by any means you are wondering Why haven’t I discussed these frameworks in details. Well, that’s because it is essential to be careful about selecting the optimum Framework for your AngularJS Application. And I won’t be able to accommodate and also justify all the aspects and factors of the various Frameworks here in this blog. Therefore in the near Future, I will be dedicating a blog solely to the different types of AngularJS Frameworks that are used by AngularJS development Company. Which I will link it down here for you to get more perspective and information about these Frameworks. And In the meantime, Do let us know about your reviews on this blog in the comment section below. As an AngularJS Development Services providing company, We have honestly always had a great experience working with all the Projects that integrated AngularJS as one of the Front-end Development Platform. 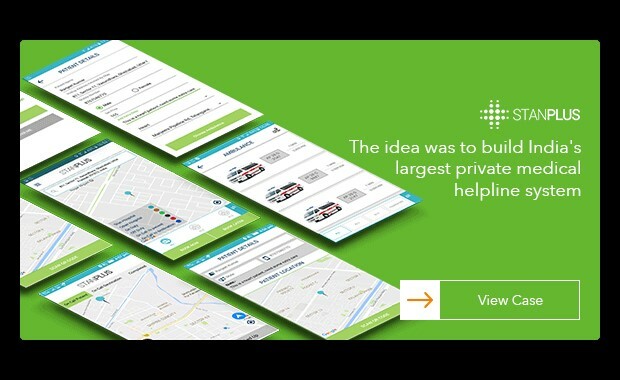 Not just us, even our Clients’ had a mutual and wonderful experience throughout the whole App development Process. And they went home satisfied with a Business enhancing Web-based Solution in their hands. What pleased us more was The fact that by using AngularJS, we were able to make this problematic Process a little less stressful and a lot more successful for our Clients. After all, that’s what We had and will always aim for- To deliver exceptional and top notch Web Solutions to our Clients that satisfies their needs and expectations. And thanks to AngularJS, this doesn’t seem to be an impossible task. Experience never lies, they say. If you envision developing a Modern and New-Gen Web Application that fully complies with the latest industry trends and practices, then there’s no better option than to either Hire AngularJS Developer or come into terms with an AngularJS Development Company.